Welcome to the South Winneshiek Recreation Department website! We are pleased to be up and running in our community since 2016! We look forward to improving our community by offering fun wellness, fitness, and physical activities for our youth and adults! Please, don't ever be afraid to reach out to us about questions, comments, or suggestions!! Blake Moen is a life-long recreation enthusiast! Blake graduated from Decorah High-School in 2012 and completed a Bachelor's Degree in Management from Luther College in May 2016. Blake has been the Recreation Director of our department since October 2016. Blake has been involved in leading many kinds of sports and recreation activities over the years. While in high-school and college, Blake was a Recreation Assistant for Decorah Parks and Recreation, where he helped lead, coach and coordinate youth basketball, baseball, softball, flag-football, soccer, volleyball, biking, fishing, canoeing, and many more! He also helped design and manage adult volleyball leagues during the winter months. 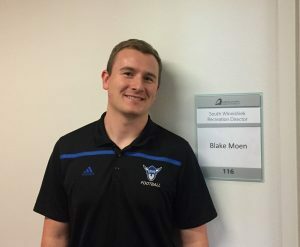 While in college, Blake coached three seasons of 9th grade basketball at Decorah-High School, two seasons of varsity football and baseball at Luther College, as well as one season of 9th grade baseball for South Winn High-School. He is currently the head boys basketball coach for South Winn High-School. He has been quite involved in different environments and communities in the world of recreation! On top of his history as a Recreation leader, he also has his Coaching Authorization in the state of Iowa, as well as a Certified Pool Operator. He is also a member of the Iowa Parks and Recreation Association. He looks forward to this department's future and program's to be implemented in our area!